In 2008, I shared my love for frozen Indian Trail Cranberry Orange Sauce and the recipe on the package that my grandmother always used to make our favorite cranberry orange jello salad for Thanksgiving and Christmas dinners. 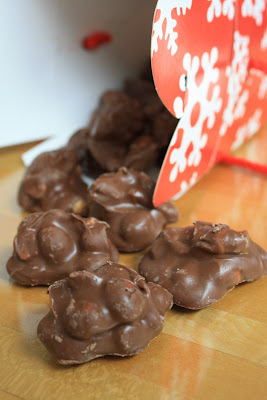 Through the years, depending on where we were stationed with the Air Force, I often had trouble finding the prepared Indian Trail mixture I needed to make my Christmas memories come alive, so I developed my own version that was identical in taste to the original. Not so difficult when something only has three ingredients -- and you own a food processor. In 2004, we moved back home to Southern Illinois and, once again, I was able to find the original Indian Trail Cranberry Orange Sauce -- but not for long. In 2009, a Cora Cooks reader reported being unable to find our favorite cranberry condiment, so I contacted Bay Valley Foods and discovered what we all feared -- ITCOS was gone for good, despite my reports that thousands of people were searching for it every year on my little blog! Now, in 2011, the news is a little better for those who are unable to make my own homemade version -- Almost Indian Trail Cranberry Orange Sauce -- or simply don't have a food processor for the chopping. Stone Gate Foods, in Shakopee, MN is producing a simple three-ingredient cranberry product that is similar to ITCOS. 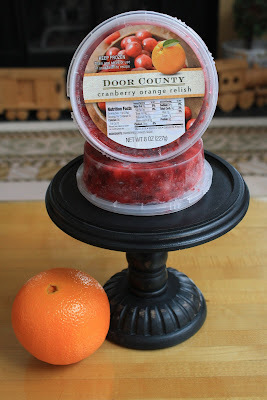 A reader reported finding the Door County Cranberry Orange Relish in her local market and I verified that, indeed, it was being marketed in several Upper Midwest states. The news was not all good though. The retail distribution did not extend to the very southern tip of Illinois so, once again, I would be making my own version for our holiday table. Yes, Virginia! There is a Santa Claus! And I'll just bet his holiday memories include something special like grandmother's molded cranberry orange Jello salad. Maybe I'll leave a carton out with his cookies and milk, just in case Mrs. Claus has trouble finding it at her local North Pole market. Easy Homemade Turkey Sausage Patties. I learned most of what I know about pork and turkey while we lived in eastern North Carolina. Turkey barns and hog farms were everywhere. It was, and is, big business there. The perfect place to learn to appreciate barbecue, country ham and the emergence of turkey as "the other other white meat." Eastern North Carolina barbecue has been well documented here as my all-time personal favorite. However, it is not the only preparation of the pig that I love. I had never eaten sausage or ham on a biscuit until moving to North Carolina, but once there, I discovered how ubiquitous they were in that area. Every McDonald's offered country ham biscuits and sausage biscuits on the morning menu. They were as big as your head -- or so it seemed to me. Smaller country ham biscuits were a staple at almost any party or social function, any time of day or night. With so many opportunities to sample them, it was only a matter of time before I developed a real fondness for country ham biscuits. What am I saying? I love them and I could eat them until my ankles swelled to the size of tree trunks. But that's not really a good thing, so I only make them once or twice a year. And thank goodness they are not available at every drive-thru in Southern Illinois! Now back to turkey. As far as I know, turkey cannot be turned into country ham, but it does make a pretty decent sausage, with a lower fat content than pork. Using the same seasonings that flavor pork yields a very acceptable turkey sausage. Since I make a pretty decent homemade biscuit, I have found a mixture of seasonings to make my own turkey sausage -- so now I can have the occasional sausage biscuit, with lower salt and a hint of maple syrup flavor too. Yum! Homemade turkey sausage is easier to make than meatloaf and faster to cook up. This recipe may be perfect for me, but don't hesitate to play around with it -- a little thyme or other herbs, more pepper, a bit of garlic, whatever works. Make the sausage ahead of time and freeze into patties. If you have leftovers, wrap the cooked sausage on a biscuit and pop it into the microwave for a quick breakfast on the run. As you can see in the picture above, this simple turkey sausage is tasty enough to be part of a festive breakfast or brunch. I served my homemade turkey sausage with sauteed Jonathan apples sprinkled with a little cinnamon, fresh raspberries, scrambled eggs with Herbes de Provence and a gooey butter cake from Gooey Louie in St. Louis. Check out all their flavors -- makes a great holiday gift for the person who already has everything! We had a lovely 60th birthday brunch for one of my favorite people, who shall remain nameless. You know who you are! What a great menu for Christmas morning brunch too! Combine salt, pepper, fennel, rubbed sage and crushed red pepper in a bowl and stir to blend. Add ground turkey and mix with hands to combine. Add maple syrup and mix with hands again. Shape and flatten sausage mixture into 3-inch round patties. Heat skillet on medium and add olive oil. Cook sausage patties about 5 minutes until lightly brown on one side and turn to brown on second side. Remove sausage patties and drain on paper towels. Serve warm. Makes 6–8 small patties.